We’re so thankful for Launch That, an Orlando-based marketing company, that donated their time and talents to redesigning and rewriting our website. 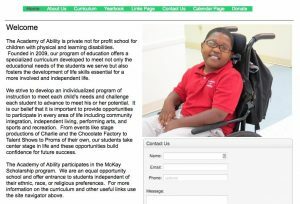 Back in 2017, Launch That approached the Academy of Ability with the goal of making a difference in our small, yet strong school. Given their expertise in web design and marketing, we were thrilled they were open to creating a digital experience that better aligns with our vision and goals. We hope that this website helps our students and their families find the resources and support they need. We look forward to working with more organizations like Launch That. If you or your organization is looking to give back, please don’t hesitate to reach out. It is with amazing people like you that we can support our students and help meet their needs.